Forgotten Buffalo: An Urban Explorer's Guide to the Buffalo-Niagara Region: Unique Landmarks, Historic Gin Mills, Old World Neighborhoods, History, Nickel City Oddities, Tours and More! 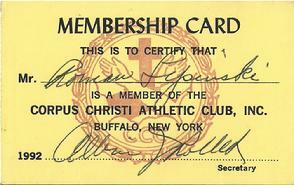 For over 75 years, the Men's Athletic Club of Corpus Christi Church was one of the most active social centers on the Eastside. The building, built in 1928, was the brainchild of a young, energetic priest named Michael Cieslik who wanted to engage the youth of the parish. During the 1950s, the club sported a roster of over 800 members who took advantage of a gymnasium, bowling alley, shuffleboard and a spacious private lounge. Social functions including polka dances would attract thousands. For a time, alcohol was banned and only beer and wine was served as the Franciscan Friars did want consumption so close to the church. In 1964, the current automatic pin setting system was introduced. After years of being closed, the Corpus Christi Athletic Club is again engaging members of the parish and the community. Volunteers have lovingly restored the vintage postwar bowling alley and the club is open to the public on Friday nights. Membership is just $25. Volunteers have restored the vintage postwar bowling alley. Available for private party rentals. All proceeds benefit the ongoing efforts to restore Corpus Christi Church. Ask to go behind the scenes to see the 1964 pin setting machine in action!